Ideally over the leg of a table or hard floor for max support. Place a book under metal base to protect table or floor. Pull the strings together and place bracelet on metal base. Strings should be on the ledge portion. Pick desired letter stamp and align at bottom of token (6 o’clock position). The engraving on letter stamp should face you. Firm grip on hammer, then stamp with intention! Place previous letter stamp back and keep alphabetical order. Grab next letter stamp. Rotate the token slightly, stamp again at the same 6 o’clock position. All Stamping Base ordered After November 2018 have a taller middle stub to help aligning the Letter Stamp in the center of the Token by placing the Letter Stamp directly against the middle stub. Get this Stamping Base HERE. Engage and get their full attention by asking “What’s Your WORD?” or Ask a more focused question by either using the MyIntent Question Cards, or one of the questions listed on our homepage. Pause, listen, and encourage as they self-reflect and thoughtfully answer. Encourage them to elaborate on their response, if needed. Their first answer might just be the surface of something they’re about to discover about themselves. Ask open ended follow-up questions like "why," "how," or "what would it take to overcome..." Try to identify the source of any imbalances, barriers, or needs and ask them about it. Invite them to break down their responses to a few words or short phrases that best represent what they’d like to invite into their life or what they need to be reminded of. Our mission is to be a catalyst for meaningful conversations and positive action. We believe there is purpose inside each of us and we want our efforts to encourage people to share more truth and inspiration with each other. We are not a jewelry or D.I.Y. company - we are a service project. What's the best way to describe MyIntent's custom pieces to someone? MyIntent's custom bracelets/necklaces/keychains are a daily reminder of your WORD of intention. A WORD that reminds you of your hopes, goals, or what matters most. How do I explain what MyIntent is to someone else? Check out MyIntent's feature on the Today show. Check out our Maker Certification page. This page answers many common questions if you are looking to make and sell handmade MyIntent products. What are popular words people request? Check out the list on our Word Finder page. How do I use my question cards? Question cards are great thought starters to get the conversation flowing. They help to identify what someone wants or needs more of in their life. Their WORD could be what they want/need – e.g. DANCE or ADVENTURE. You can also follow-up with questions on what’s keeping the person from achieving what they want/need, and this can often times be their WORD – e.g. COURAGE, FAITH, BELIEVE. This is your time to really connect with the people in your community! How do I tie my own bracelets? Check out our video playlist on creating your own bracelets! How do I get deep impressions? Stamping on a sturdy surface that allows vertical force transfer helps with deep stamping impressions (A table transfers your hammering forces horizontal vs. a table's leg transfers it vertically). Try stamping directly over a table’s leg, a wooden/metal block, or on the floor. A stamping post (see tutorial above) is great at enabling deep impression and reducing noise/bounce. This 15lb. Anvil is small, portable, and dampens noise! This is a great alternative if you don’t have the capacity to make a wooden stamping post or if your stamping area is limited on space. How do I align the letters? Start with the 5 tokens that come in your Maker Kit and play around. Through practice, maybe there is no perfect, but that’s the beauty of being a MyIntent Maker! This is unique to you. Perfect is your own style! For Maker Kits ordered before Nov. 2018 - If you’d like some assistance with alignment, you can add a line using permanent maker to the middle of the stub on the stamping base – see photo above. 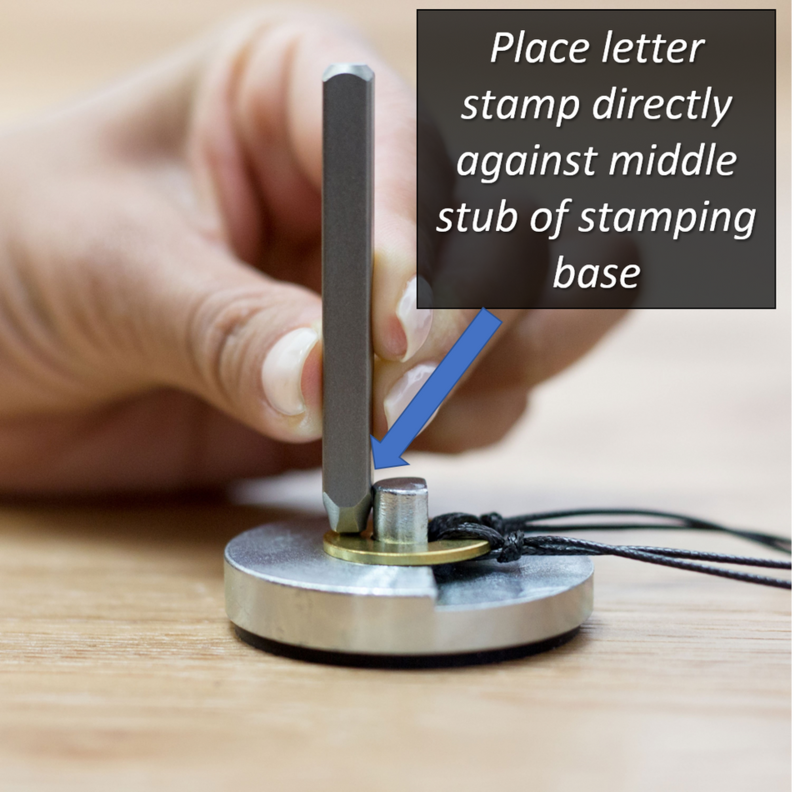 For Maker Kits after after Nov. 2018, the round stamping base was updated to allow you to place the letter stamp directly up against the middle stub of the stamping base. What size are the MyIntent stamps? How big are the tokens? The tokens are about the size of a quarter. What is the font of the stamps? The font is San Sarif UPPERCASE for our stamps. To keep with brand consistency and to prevent customer confusion, we request that you do not use different fonts or casing for stamps. ie. script or newsprint in font, and lowercase stamps. Where do I find the rules about pricing for an event? Pricing information is covered in the Maker Certification. Are we allowed to just give them away or does that require a certification as well? No certification needed if you are just giving them out. How can I download the MyIntent logo? Can I use the photos on the MyIntent website? You can use any product shots found on the MyIntent website. Please refrain from using the photos of people on your own websites. Do you have any tips on how I can market myself as a Maker? In-line with MyIntent’s mission, we highly recommend focusing on in-person connections and local partnerships. Focus on communities that are familiar with intention and goal setting – e.g. yoga/meditation studios, gyms, charity walks, etc. Is my business part of MyIntent or is it an independent business entity? As a MyIntent Maker, you are your own business entity and should sign-up for events or business opportunities as your own entity. You are responsible for any insurance, taxes, and state/federal business licenses, etc. You are also not an independent contractor of MyIntent (an independent contractor would be someone MyIntent hires to work on specific projects like building a website or performing design work). Looking for stampers to help with an event? Join thousands of Makers in our MyIntent Maker Facebook Group. A community creating positive change in their communities while sharing inspiring stories and tips & tricks. All refills and supplies are available in our Maker Store!